The term, ‘the big five' was coined during the hunting era and referred to the five animals most desired by the ‘white hunters'. These days, the only hunting that is done of the legendary ‘big five' is by camera. They are: the elephant, rhino, lion, leopard and buffalo. The African elephant lives in small family groups of 10-20 elephants, which often congregate in much larger herds at water or food sources. Elephant society is matriarchal, senior females dominating the herds while the bulls live alone or in bachelor groups. Depending almost entirely on its trunk for scent and communication, for washing, clearing, carrying, learning, drinking and eating, an elephant's lifespan (60 -70 years) depends very much on its teeth, which are highly adapted to its mode of living. As one tooth wears away the next moves down the jaw to replace it, and when the last tooth has come forward and is worn down the elephant will die of starvation. Although their sight is poor, elephants have an excellent sense of smell and well-developed hearing. Like humans, elephants lead complex inter-dependant social lives growing from helpless infancy through self-conscious adolescence to adulthood. Surprisingly graceful on their padded and carefully placed feet, a large herd of elephants can merge into the trees and disappear within minutes; their presence betrayed only by the noisy cracking of branches as they strip trees and uproot saplings. 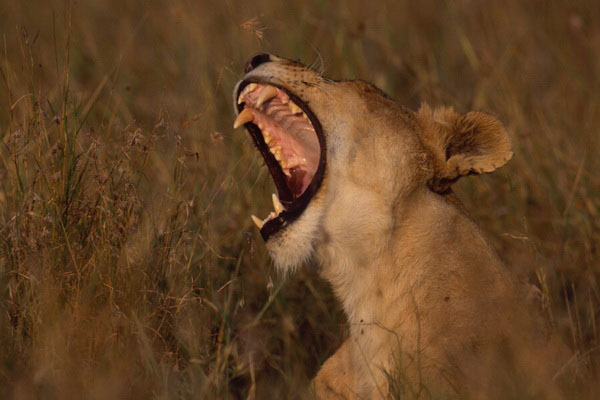 The lion is the largest of Kenya's three big cats, weighing up to 280 kg. Inherently lazy, the lion is immensely powerful; at one leap it can clear fences 4 meters high and chasms 12 meters long. Its amber eyes, like those of the leopard, differ from those of other cats in so much as they are circular rather than oval. Lions hunt communally, running down their prey at a top speed of around 64 kph and, although they will kill almost any animal, they prefer large herbivores which are the mainstay of their diet. Sightings of lions are normally during daylight hours when the pride is at rest, having spent most of the night in hunting, patrolling and playing. Although they rarely attack humans without provocation, lions are extremely dangerous and should be treated with particular caution (you should never get out of your car in lion territory). 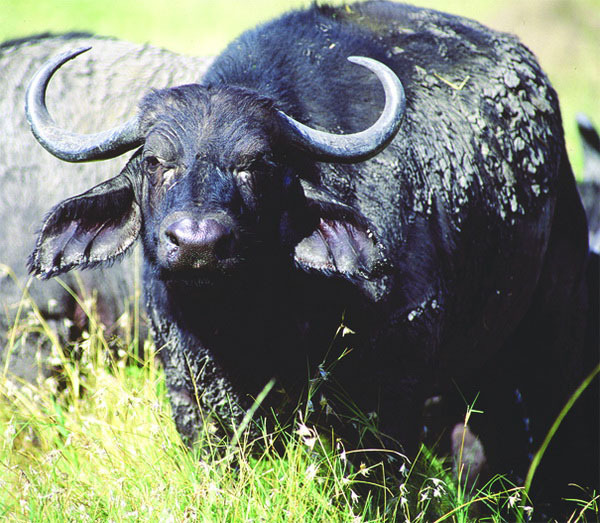 The African or Cape buffalo is closely related to the domestic cow. Generally docile, buffalos can be extremely dangerous when threatened or surprised and must be regarded with extreme caution - especially lone bulls or cows with calves. Intensely gregarious, buffalos form into herds of between 200 and 2000 animals. Voracious eaters (both grazers and browsers), they spend most of their 15-20 year lifespan consuming fodder to maintain their strength and stamina. 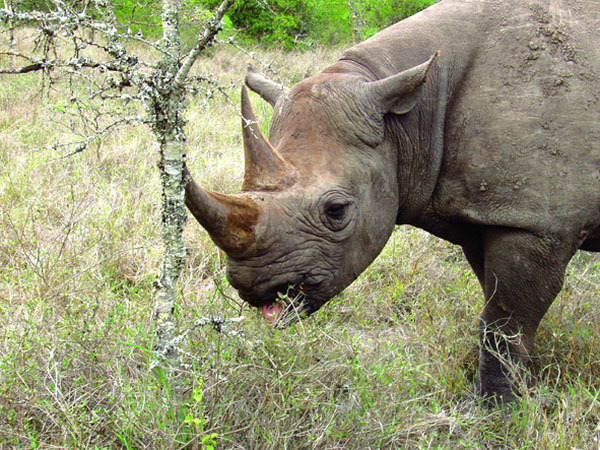 Ruthlessly hunted for its horn, which is widely used in Chinese medicine and much prized as a dagger handle in the Middle East, the black rhino came close to extinction at the close of the last century and still remains Africa's single most endangered large mammal. The smaller of the two rhino species (weighing approximately 900 -1,400 kg), the black rhino has a more concave back than the white rhino, relatively small, three-toed hoofs, and a pointed prehensile upper lip, which is ideally suited to browsing in the bush and forest. 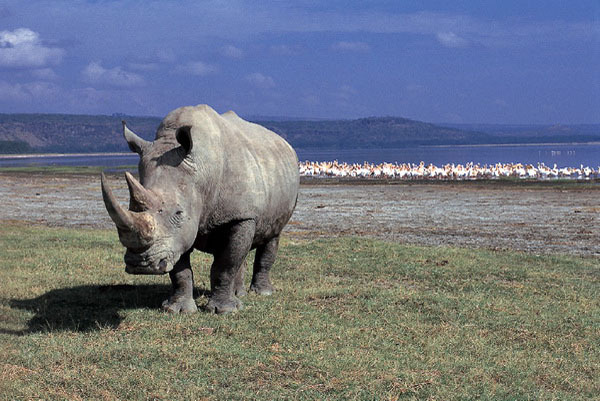 Contrary to popular imagination, rhino are neither black nor white; both are a similar shade of grey. The name ‘white' originates from the Afrikaans word ‘weit', which means ‘wide', and refers to the width of the white rhino's mouth, which is specially adapted to grazing. To tell the difference between black and white - look at the mouth of the animal, the white rhino is a grazer and has a wide mouth, the black rhino is a browser and has a pointed prehensile (capable of grasping) lip. The lion is the largest of Kenya's three big cats, weighing up to 280 kg. Inherently lazy, the lion is immensely powerful; at one leap it can clear fences 4 meters high and chasms 12 meters long and its amber eyes, like those of the leopard, differ from those of other cats in so much as they are circular rather than oval. Lions hunt communally, running down their prey at a top speed of around 64 kph and, although they will kill almost any animal, they prefer large herbivores which are the mainstay of their diet. Sightings of lions are normally during daylight hours when the pride is at rest, having spent most of the night in hunting, patrolling and playing. Although they rarely attack humans without provocation, lions are extremely dangerous and should be treated with particular caution (you should never get out of your car in lion territory). 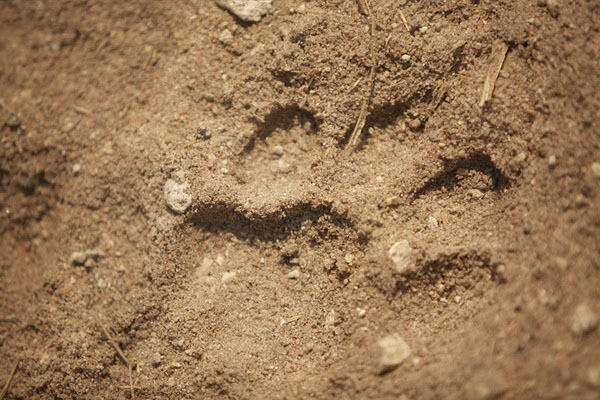 The unearthly ‘oooo-ooop' call of a spotted hyena in the night is one of the most memorable sounds of the African bush. Often reviled as a cowardly scavenger, the spotted hyena is actually a very efficient predator whose numbers are governed by a matriarchal social system. 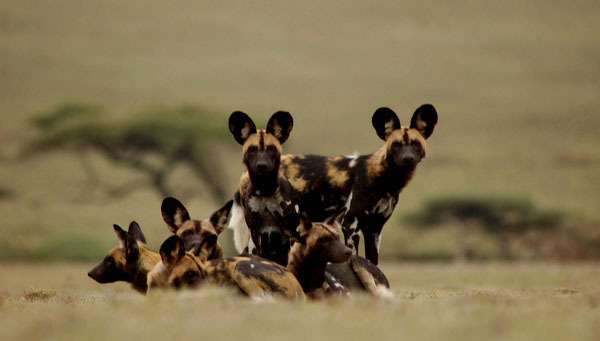 Preferring to hunt in packs, the spotted hyena lives on carrion and both large and small mammals. Lean and long-legged, the striped hyena appears to be slightly more robust than its spotted cousin thanks to its long, shaggy mane and the handsome ‘cape' that runs along its back. Belonging to loose clans, usually foraging alone and being a relatively poor hunter, the striped hyena scavenges mostly from the kills of other animals or resorts to catching sundry insects and small vertebrates. 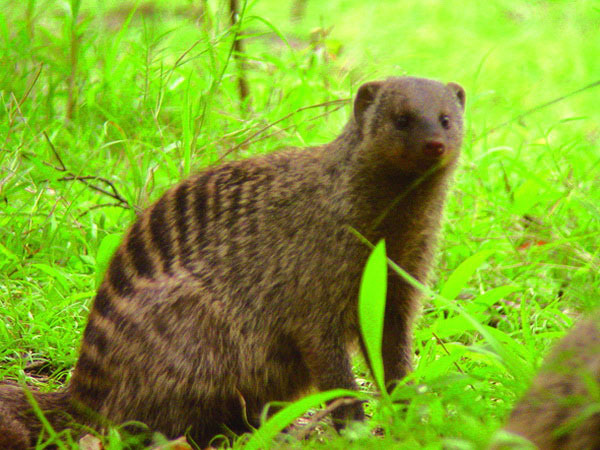 Africa's equivalent to the European badger, the ratel enjoys a formidable reputation for ferocity, reputedly attacking animals the size of buffalos; and even vehicle tyres; consequently it has few natural enemies. Enthusiastically omnivorous, ratels are active between dusk and dawn. Around 90-100 cm in length, a ratel weighs up to 15 kg and should be treated with caution. Active around sunrise and just before sunset, this charming aquatic creature lives on a diet composed mainly of mollusks and frogs. Highly social, living in groups of 6-10 animals, the Cape clawless otter is larger and heavier than its cousin the spotted-neck otter; and, as its name would suggest, it has no claws or webs on its fingers. Its hind toes, however, sometimes feature short pointed claws. Also active around sunrise and before sunset the spotted-necked otter is an aquatic creature with claws and webbed feet well adapted to the habitat of swamps and inland waters. Light chestnut in colour, it has white to orange under parts decorated with irregular brown spots. A social animal, the spotted-necked otter usually lives in groups of 6-10 animals and dines on molluscs and frogs. 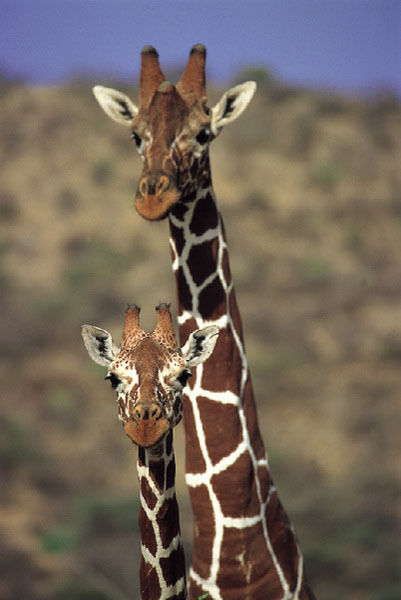 Kenya hosts three species of giraffe: Rothschild's, Masai and Reticulated. The world's tallest mammal (up to 5.2 meters tall), the giraffe uses its unique 45 cm long tongue and agile lips to browse on the leaves of trees that other creatures cannot reach, its especial favourite being acacia. Widespread and common in savannah, open woodland and plains, giraffe have a lifespan of 25-35 years. Non-territorial, they gather in loose leaderless herds to browse by day, while at night they lie down and ruminate. Masai giraffe have a broken pattern of dark blotches on a buff background. The more solidly built Rothschild's giraffe, is paler in colour and has distinctive white ‘stockinged' forelegs. 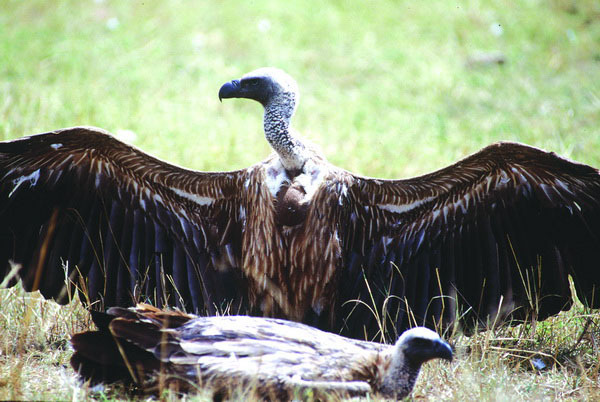 Both sexes have knob-like horns but can be told apart due to the fact that the males have bald horn tips while the females' are hairy. 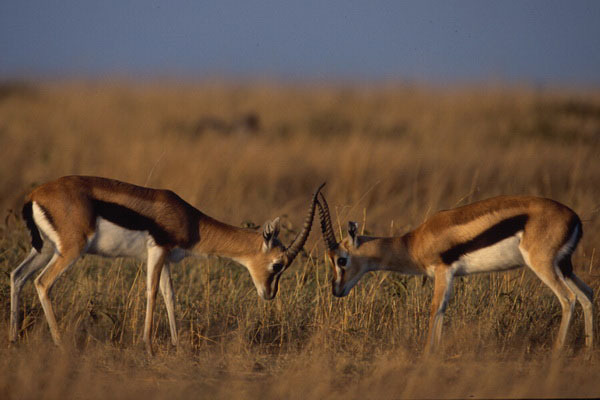 Kenya features two species of gazelle: Thomson's and Grant's gazelle, both of which feed as grazers and browsers. 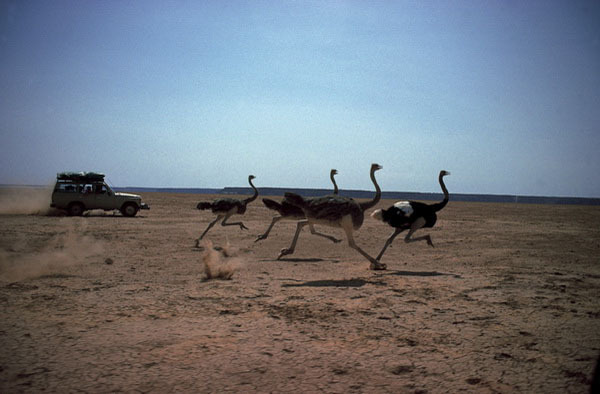 The preferred prey of most predators, gazelles survive by being constantly alert and poised to flee within seconds of alarm (they can accelerate to a top speed of 80 kph when in flight). They have also evolved a sophisticated communication system consisting of a range of signals to warn against the approach of predators. The pretty Thomson's gazelle, with its short stumpy tail perpetually in motion, is the smaller of the two and is famous for its stiff-legged standing-still jump, which is known as ‘pronking'. 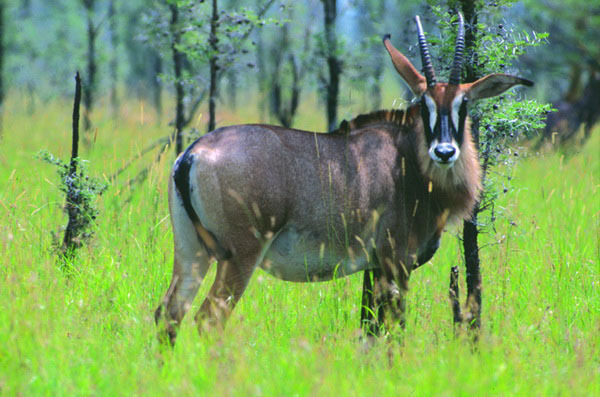 The larger impala-sized Grant's gazelle can be differentiated by the fact that it lacks the distinctive black side stripe of the ‘Tommy'. Star of the world's greatest animal spectacular, the annual migration from the Serengeti to the Masai Mara, the wildebeest is an extremely gregarious animal, moving in herds that can number up to 150 females and young, headed up by 1-3 bulls. Unmistakable with their peculiar head-high, rocking gait, wildebeest live almost entirely on grass, and in the dry season a herd can cover up to 50 km a day in search of water. Males make a continuous cacophony of low moaning grunts and explosive snorts. Did you know? 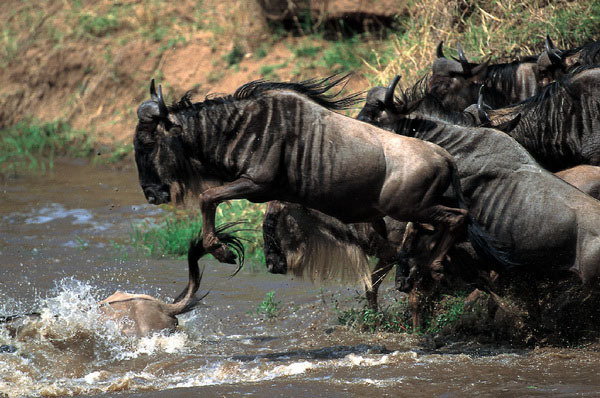 That a newly born wildebeest can run within minutes of birth? 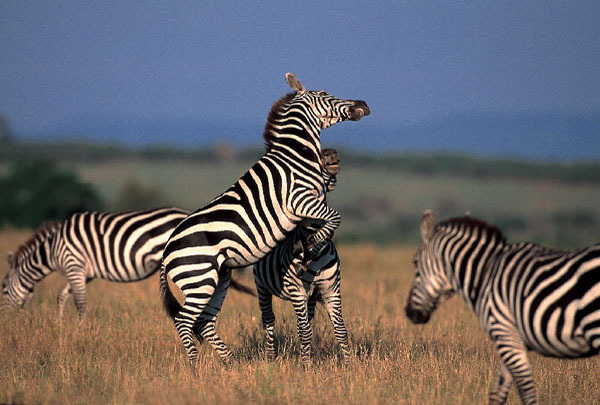 Unmistakably marked with broadly alternating black and white stripes, zebra are primarily grazers. They also enjoy a complex social system, which is built up around small groups of related mares over which the stallions fight with much spectacular plunging, rearing, slashing and kicking during the mating season. 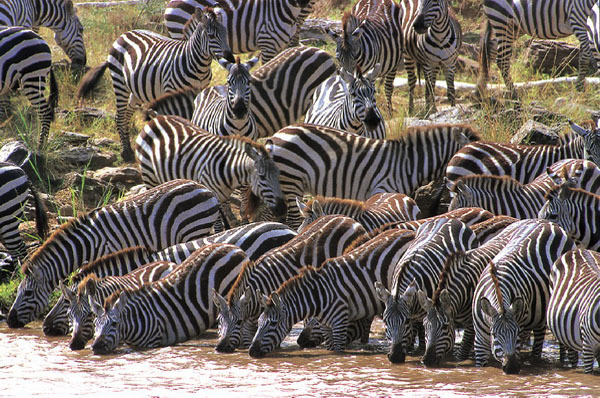 Two species of zebra inhabit Kenya, the most common being the Burchell's zebra, which is best-known for accompanying the thousands of wildebeest that make up the annual migration from the Serengeti to the Masai Mara - and back again. East Africa's other zebra species, the Grevy's zebra, is larger than its cousin with finer stripes and large rounded ‘ Mickey Mouse' ears. 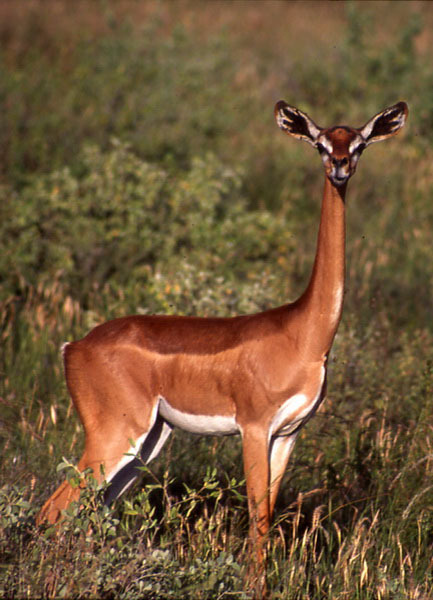 Abundant in Kenya, the impala is both a browser and a grazer; which means it can eat whatever the other herbivores don't. Famous for their turn of speed, impala can leap 10 meters in one bound or 3 meters straight up into the air. The males, who have long lyre-shaped horns, live in bachelor groups outside the breeding season, but can be seen vigorously defending their harems during the rut. Red to tan-coloured the Jackson's hartebeest is confined to the Lake Victoria area and is slightly smaller and lighter than its cousin, the Coke's hartebeest, which is found in the rest of Kenya. A highly gregarious antelope, the topi lives in herds, often mingles with other grazers, and is frequently to be found perched on a series of preferred vantage points, such as termite mounds, from where it spies out its territory. Similar to the hartebeest in appearance, though slightly smaller and darker, the topi has dark patches on its legs and face and sometimes appears almost plum coloured or purple. Both sexes have horns that curve gently upwards and backwards. One of Africa's rarest antelopes and the third largest of Kenya's antelopes, the roan (or Korongo as it is known in Swahili) is a large, grey to rufous antelope with a distinctive black and white face, not unlike a tribal mask. It also boasts a conspicuous mane of stiff, black-tipped hair, long, narrow, pointed ears with brown tassels at the tip, and thick heavily ridged scimitar-curved horns in both sexes. Strongly territorial the roan prefers a plains habitat with sparsely wooded grassland. It is also highly dependant on water, which it must consume in large quantities. 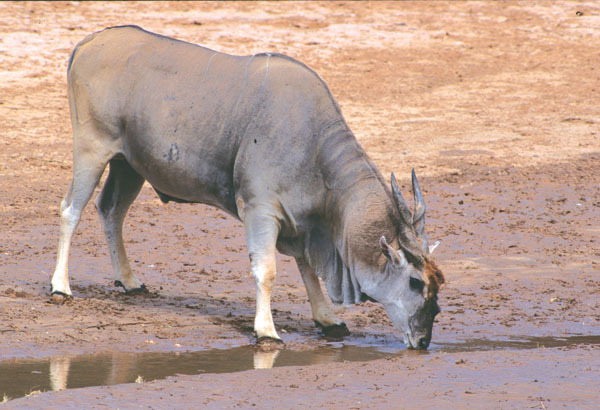 Sometimes associated with eland and other plains animals, the roan is a grazer that prefers a diet of tall grass supplemented by twigs and leaves from the denser habitats. With an approximate lifespan of 15 years, roan live in herds of up to 20 members, led by a bull. During the mating season, enthusiastically rutting males can be seen jousting with their rivals, going down on their knees and making sweeping movements with their horns. Weighing close to a tonne, the eland is Africa's largest antelope. Resembling an ox but with beautiful spiralling horns that rise elegantly off the brows of both sexes, the eland lives in groups of around 6-12 animals and feeds on grass and foliage during the early morning, late afternoon and also at night. 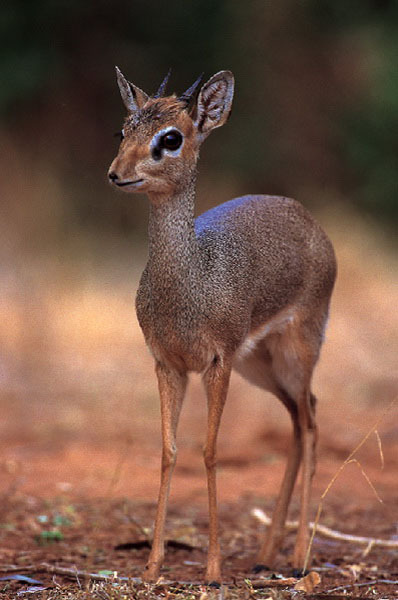 This tiny forest antelope (only about 30 cm tall and weighing approximately 8 kg) is rarely seen and moves around mostly at sunrise and sundown. It leaves a telltale clue to its passage however, in the form of a strong, musky scent, which is secreted from a large gland below the eye and lingers long after the suni has left. The small and graceful oribi antelope has a conspicuous bare black glandular patch below the ears, a short black-tipped tail and black knee tufts. 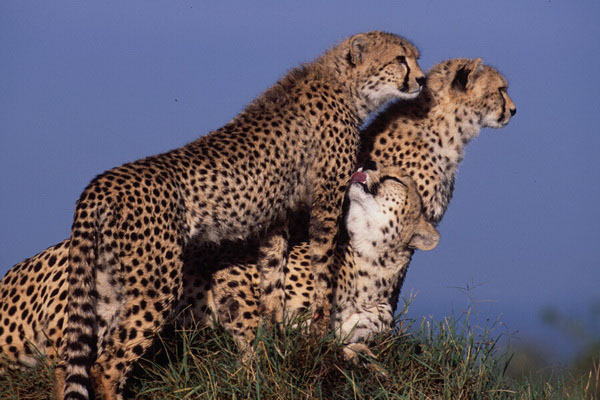 Living in strongly bonded pairs or small groups, oribi inhabit grassland and dense undergrowth. Largely diurnal, they have a relatively long neck and straight upstanding horns (in the male), while the colour of their silky coat varies from drab fawn to bright rufous. When alarmed the oribi will give a loud shrill whistle or a sneeze and leap straight up into the air before bounding off into the undergrowth. Similar to a duiker, but taller and more slender, the steinbok is a light reddish-brown colour with pale under-parts and can be identified by the black mark or ‘blaze' on its nose. 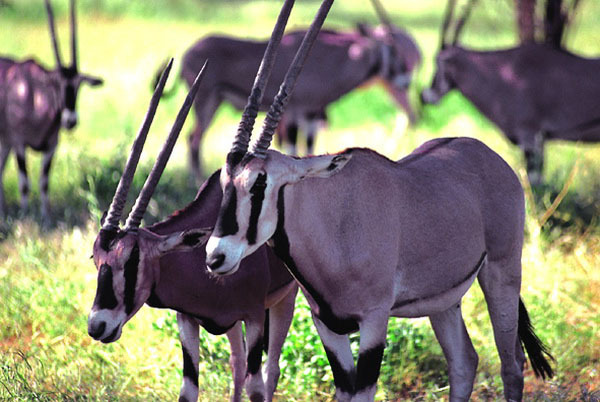 Males have small widely separated horns. A solitary animal, whose only contact with its fellows is during the mating season, the steinbok is active morning and evening. 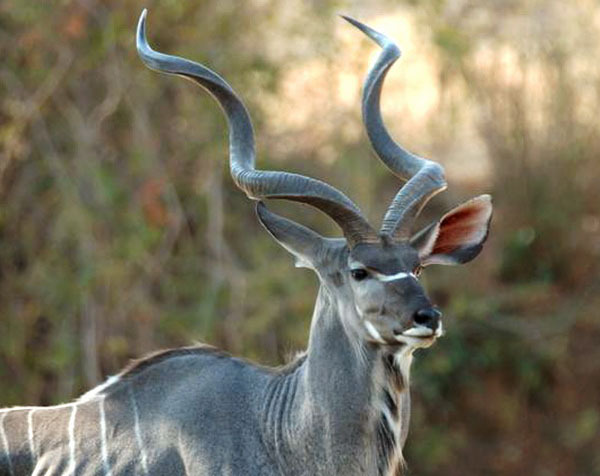 A rare antelope, distinguished by a pair of the most magnificent spiral horns in the antelope kingdom (averaging around 130 cm in length); the greater kudu is large, slender and grey in colour. It is also distinguished by six to eight prominent vertical white stripes on either flank (unlike its cousin the slimmer lesser kudu, which has eleven to fifteen stripes on each flank. Despite its impressive weight (280-320 kg), the greater kudu is also a phenomenal jumper, clearing two metres at a single bound and enjoys acute hearing - accentuated by its ability to swivel its large round ears in almost any direction. Due to the fact that they are hunted by all the large predators, reedbuck are essentially shy and easily startled. 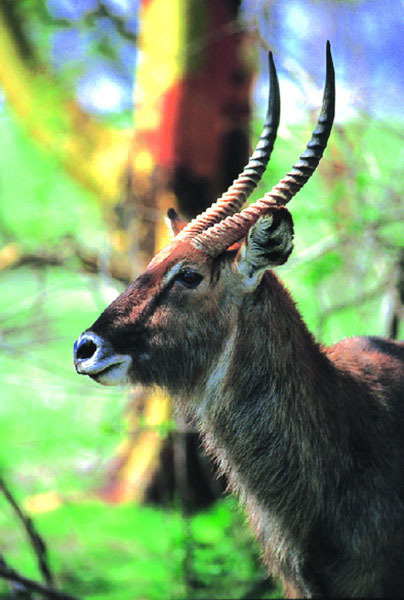 The Chanler's mountain reedbuck, prefers a habitat of open grassy slopes and is found only in central and western Kenya. A member of a uniquely African group of herbivores, the hyrax physically resembles a large, plump, brown guinea pig and shares an ancient lineage with both the aardvark and the elephant. Aggressively territorial, hyraxes live in colonies of between 10-60 animals and are gregarious, sleeping together in large shaggy piles to keep warm and safe from predators. Infamous for their spine chilling screams, emitted variously depending on circumstances as a ‘keep away' warning or ‘come on' mating call, hyraxes are uniquely adapted to their environment in that the sweat generated by their rubbery paws creates a sticky surface which allows them to scale near-vertical rocks and tree trunks. 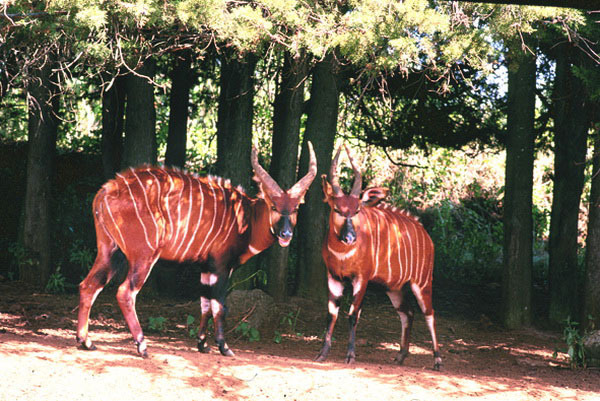 Once abundant in the Lake Victoria and Nzoia river basins, sitatunga are now found only in scattered locations throughout western and central Africa; particularly in the papyrus swamps of Lake Victoria and in the King' wal Swamp near Kapsabet (there is also an introduced population of sitatunga in Lewa Downs). Saiwa Swamp remains, however, the only place in Kenya where these elusive creatures have become relatively habituated to the proximity of humans. Known in Swahili as the ‘Nzohe', the remarkable and rare sitatunga (pronounced ‘statunga') is a long-legged antelope, which has ingeniously adapted itself so as to be able to exploit the abundant food resources of the swamp habitat. 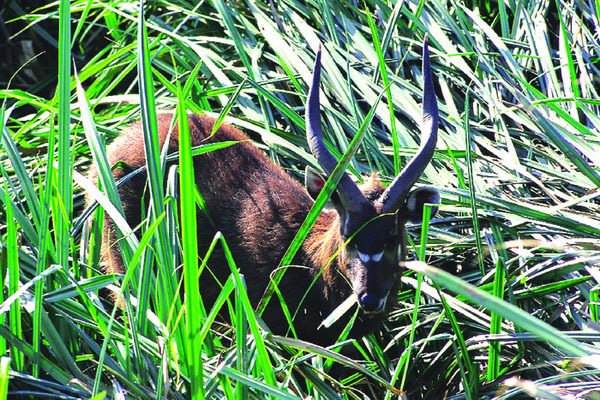 Once able to move freely through the region's swamps, the encroachment of humans and their agriculture has forced the sitatunga to retreat into a few isolated islands of safety. The sitatunga's shaggy coat is oily and water repellent, while its elongated and splayed hooves allow it to walk on submerged vegetation. Easily able to outrun its predators while in the swamp, on land the sitatunga has a much clumsier gait, and is seriously disadvantaged. Reddish-brown, the sitatunga has very large ears and the males have horns. Moving with slow deliberation so as to avoid detection, the sitatunga gently enters the water and sinks until nearly all of its body is submerged. It may then spend most of its day submerged or resting in reedy shade. Young sitatunga are born in the dry season and concealed by their mothers amongst the reed platforms of the swamp. Ungainly on their long hooves, they move with difficulty and often fall over obstacles. A good swimmer, when alarmed the sitatunga dives deep and remains almost entirely submerged - but for the tip of its nose. Extremely shy it prefers to feed morning and evening and occasionally leaves the swamp after dark to browse. Sitatunga are difficult to observe, but the best time to spot one is between the hours of 6.00am and 11.00am, and 4.00pm and 6.00pm, when they are most active. Silence, watching and waiting are the tricks of the trade, as well as keeping a close watch over the paths and tunnels that the sitatunga makes through the reeds and rushes. Did you know? The sitatunga (Tragelaphus spekei) is named after John Hanning Speke, who discovered the source of the Nile at Lake Victoria in 1858. Weighing up to four tonnes, hippos are the third-largest land animals in the world. True amphibians, they can stay totally submerged in water for three to four minutes at a time; they also eat, mate and give birth under water. Spending most of their day resting in water, hippo come up frequently to blow air and recharge their lungs. At sundown they leave the water in schools (or ‘sounders') to spend the night grazing their home range which is usually marked by well-defined pathways, each animal consuming up to 60 kg of fodder per night. Hippos have fearsome teeth and on land can be aggressive and extremely dangerous. 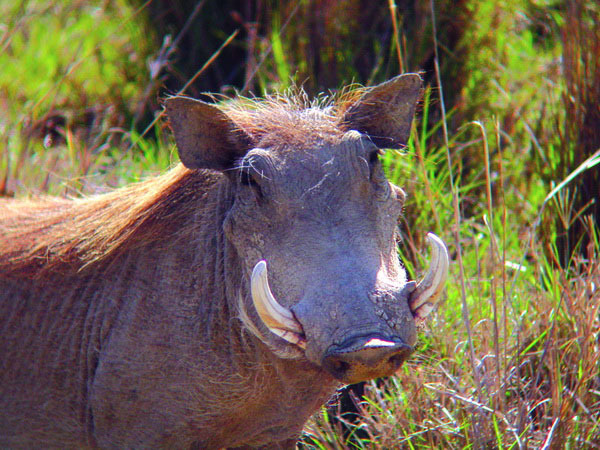 A large, hairy wild pig, the giant forest hog has a very broad muzzle, ash-grey skin and broad fungus-like glandular skin swellings below the eyes and across the cheeks. 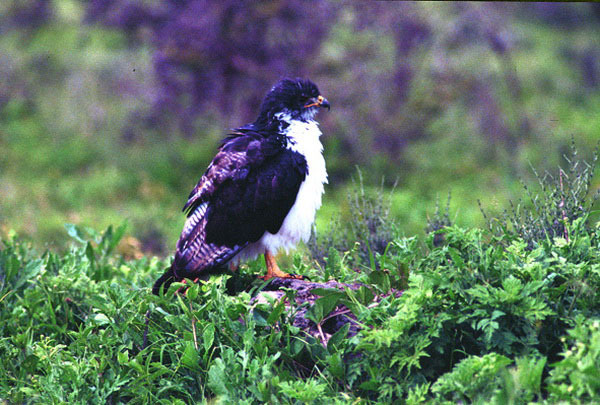 Mostly active at night, they rest by day in dense thickets pierced by tunnel-like runs leading to nest-like resting places. Rarely seen, they are thought to browse or ‘rootle' (dig up the earth in search of succulents roots and rhizomes) and live mainly on shrubs and fallen forest fruit. Categorized as ‘primitive' tree-dwelling primates, bush babies are more closely related to 60-million year old fossils than they are to today's more familiar monkeys and apes. Equipped with enormous eyes, which allow them to see in almost total darkness, they are exclusively nocturnal and can leap up to 7m through their preferred habitat of dense woodland vegetation. Capable of rotating their heads through 180 degrees from front to back when hunting for fruit, seeds, insects and small reptiles, they are extraordinarily vocal, emitting a baby-like cry that may be repeated up to 100 times in an hour. Weighing up to 450 kg, the massive bongo is the largest and rarest of Kenya's forest antelopes; it is also wholly endemic and restricted to the Kenyan highlands. The last sighting of a bongo on Mount Kenya was in 1994, while there are believed to be only one hundred or so remaining in the Aberdare National Park. 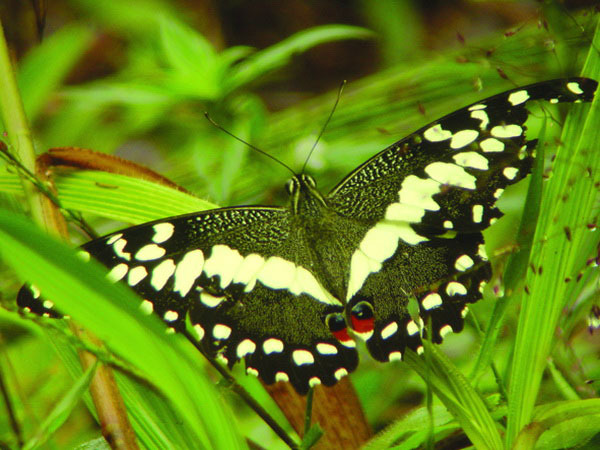 Shy and easily disturbed, bongos range from the high forest glades to the bamboo zone, and even up to around 4000 m in pockets of sheltered woodland. Easily recognizable by the 12-14 vertical white stripes that emblazon the flanks of their bright chestnut coats, bongos tend to live in groups, while the old bulls usually leave their group to live out the last of their 12-14 year lifespan alone. A bongo breeding and re-introduction programme is currently being carried out by a number of institutions including the Mount Kenya Game Ranch, the Bill Woodley Mount Kenya Trust and KWS. These enchanting creatures have glossy black fur, with a white face, bushy white tail and a silken, white fur cape that streams out behind them when they leap through the trees. 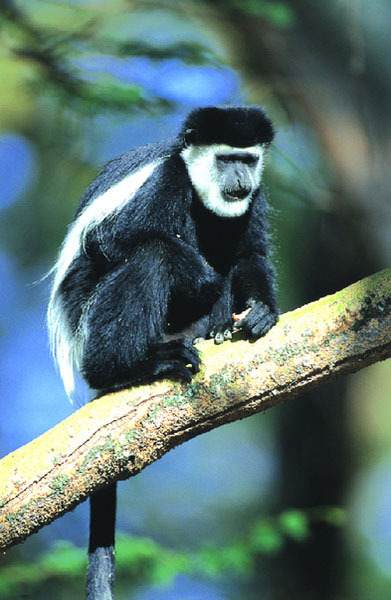 Usually found in troops of up to 25 monkeys, the colobus is arboreal and spends most of its time in forest areas. Colobus can be distinguished from other monkeys because they have no thumbs, their hands having lost the thumb as a genetic modification to make hooking on to passing branches easier (hence their name which means mutilated in Greek). Like all primates, family bonds are strong and social grooming is an important pastime. An inhabitant of swampy forests and riverine areas, the regionally endangered de Brazza's monkey lives in family troops and forages for leaves, shoots, fruits, insects and lizards. 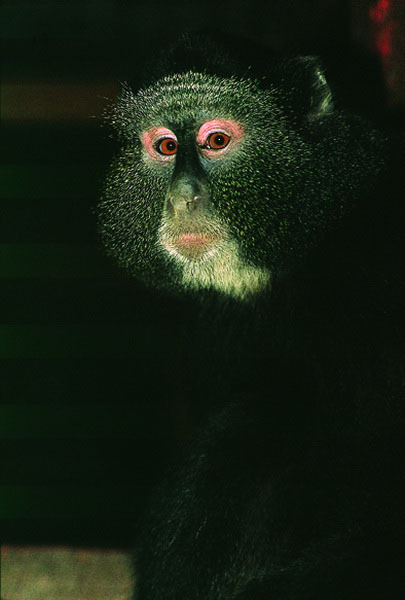 Easily distinguished by its white-bearded face, the de Brazza is active mainly in the early morning and late afternoon and is both a strong climber and a good swimmer. 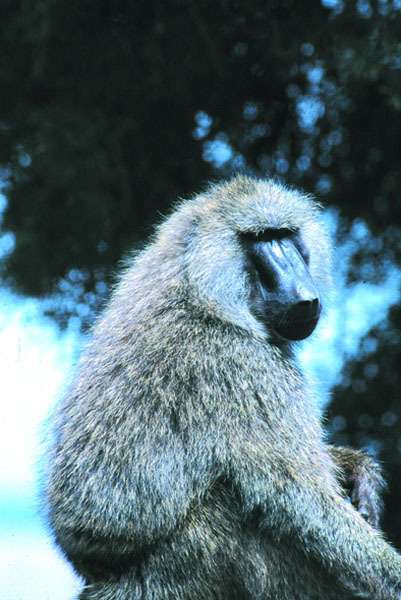 Similar to the vervet monkey but slightly larger and much darker, the Sykes' or blue monkey has a grey to black face, black shoulders, limbs and tail and a reddish-brown to olive-brown back. 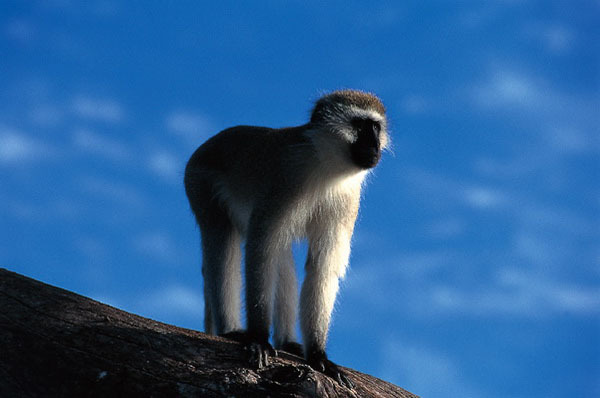 More arboreal than the vervet monkey, the Sykes' monkey generally prefers a dense forest and woodland habitat, where it feeds on fruit, bark, gum and leaves. Crocodile (reptile) is the common name for members of the crocodilian order (including alligators, caimans and gavials). The Nile crocodile is one of the best known of the 12 species of crocodile and is Africa's largest reptile reaching a length of up to 6 meters and weighing up to 1 metric ton. Adult crocodile have no predators, though territorial disputes between males can cause serious injuries and hippos will occasionally nudge them off a sandbank if they threaten a calf. Well adapted as a predator the crocodile has powerful jaws and tail, both of which they use to kill their prey. Olive or dull grey they are cold blooded and bask during the day to maintain constant body temperature. Living in a freshwater habitat crocodiles are strictly carnivorous. When breeding the female lays between 30 and 40 eggs which hatch after 90 days. 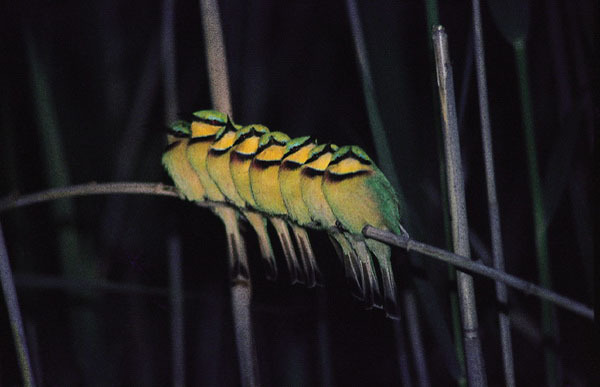 The hatchlings (which hatch April to May) are guarded by the female. Bony plates called osteoderms form a kind of armour in their thick skin, their 30-40 teeth lock solid when clamped shut and they often use their tail to knock prey into the water where it is gripped by their powerful jaws. At this point, the crocodile will rotate rapidly in the water, tearing its victim apart as it does so. On land, crocodiles move quickly - either in a belly crawl or on all four legs. The Nile crocodile was revered by certain ancient Egyptian sects and mummies of crocodiles have been discovered in Egyptian tombs. Only two creatures from the Jurassic period persist in the African ecosystems: the crocodile and the tortoise. And, because the tortoise's ancestry stretches back over 245 million years into the mists of the Permian Age (between the Carboniferous and Triassic periods about 290 to 245 million yeas ago), it is probable that the tortoise we see today looks much the same as the tortoise walking about under the feet of the dinosaurs. 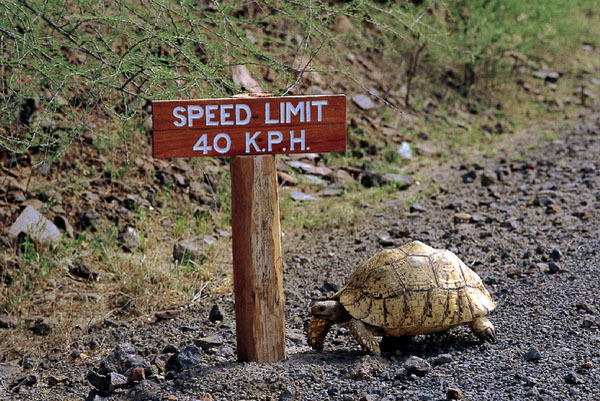 As to why more slow-moving tortoises are not trodden underfoot by moving herds, according to Maasai legend it is because they exude a scent similar to that of a hunting lion. 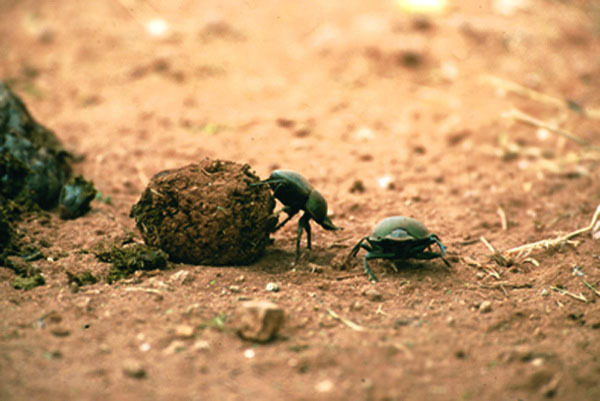 Often encountered rolling along atop an immense ball of dung, this amusingly determined beetle is usually heading off in search of a hole in which to bury itself and the ball. There it will either lay eggs, or devour the dung. Known as the ‘sacred scarab' it regularly featured as an adornment of the ancient Egyptians, who saw it as a manifestation of the sun god, Ra, rolling his ball of fire across the sky. 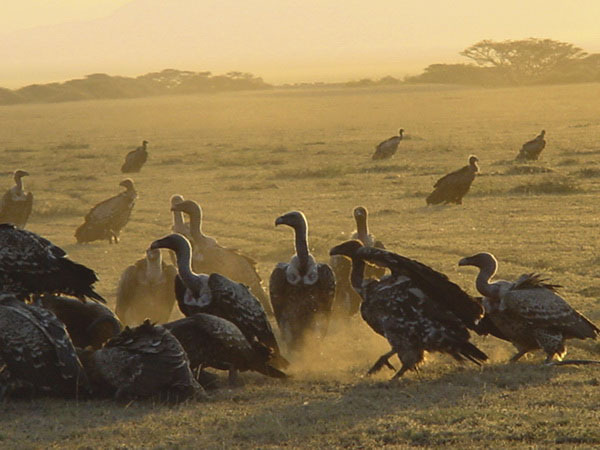 Boasting the highest bird species count in Africa and the fourth highest in the world (after Peru, Venezuela and Colombia), Kenya numbers over 1,089 species of birds (compared to 300 in Britain and 600 in North America). And, though forests cover only 1% of sub-Saharan Africa, 30% of Africa's total of 1,500 bird species live in her forests. In Kenya, 335 of the bird species inhabit the forests, of which 230 are entirely forest-dependant and 110 are forest-specialist.